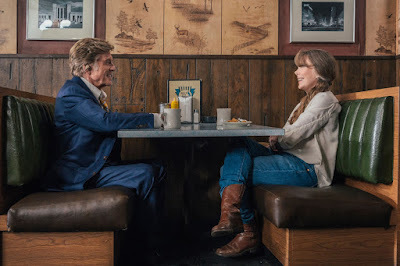 Not long into “The Old Man & the Gun”, the eponymous gentlemanly bank robber, Forrest Tucker (Robert Redford), squires Jewel (Sissy Spacek) on something approximating a first date. Gratefully, writer/director David Lowery, working in conjunction with editor Lisa Zeno Churgin, does not limit this sequence to just a few snippets of conversation or a couple lingering looks and then a smash cut, say, to Jewel’s front door. No, the duo allows these actors to stretch their legs and lets this scene breathe, a series of reverse shots and then a lengthy medium shot from the side of the booth when Forrest and Jewel verbalize their seeming emotional connection, underlining it. One, it’s nice – nay, grand – to see a couple stars just luxuriating in their high wattage, having fun, as characters, sure, but also as themselves playing these parts. Two, it’s grand – nay stupendous – to see a couple stars this age get this much screen time all to themselves without the interference of any glam whippersnappers or fearful cuts away from backseat producers frightened any random kids in the audience will look down at their phones. That’s because even if this movie is about robbing banks, crime improbably becomes a conduit to The Old Man’s reckoning with Old Man Time. The impetus for this first date, in fact, is Forrest making a bank robbery getaway, switching out vehicles and then stopping to help Jewel on the side of the freeway where her truck has broken down as the cops sail by. It might be a meet cute cliché, this, but Lowery subverts the cliché by employing it as an introduction of tone. Forrest robs numerous financial institutions throughout the film but each heist is evinced in a low key register, muting tension through a jazzy score and playing up the character's courtly air, evoking the opening scene to “Out of Sight”, again and again where every bank manager and teller makes sure to tell Detective John Hunt (Casey Affleck) that Forrest might have shown them a gun but that he was also smiling. If that makes it sound like “The Old Man & the Gun” softens the inherent threat of its bank robber, Lowery carves out space to demonstrate the emotional toll it takes on others. A scene when Forrest commandeers a car finds him inadvertently taking a mother and her child hostage, and the way Redford plays the moment connotes the fear he can install in others. And crucially, Hunt’s trip to see a woman (Elisabeth Moss) who thinks she might be the bank robber’s daughter convincingly sketches the emotional wreckage that Forest unwittingly left behind. Though Lowery is partially interested in the age-old notion of the detective and the robber squaring off, with the latter leaving the former a taunting note, he is more interested in using Hunt as a counterpoint to Forrest’s single-mindedness. If he’s an investigator, he is presented just as much with a father, often at the same time, in a bank with his son where he fails to realize Forrest is pulling a job and showing his children the result of his labors. He even gets pulled off the investigation when the FBI gets involved, a story point that doesn’t build to what you might think, with Affleck, in a deliberately weary performance, even admitting to his kids that the feds will probably do a better job. Doing a job is what ultimately seems to drive Forrest, like an elderly football coach who worries retirement is what will kindle his kicking the bucket. 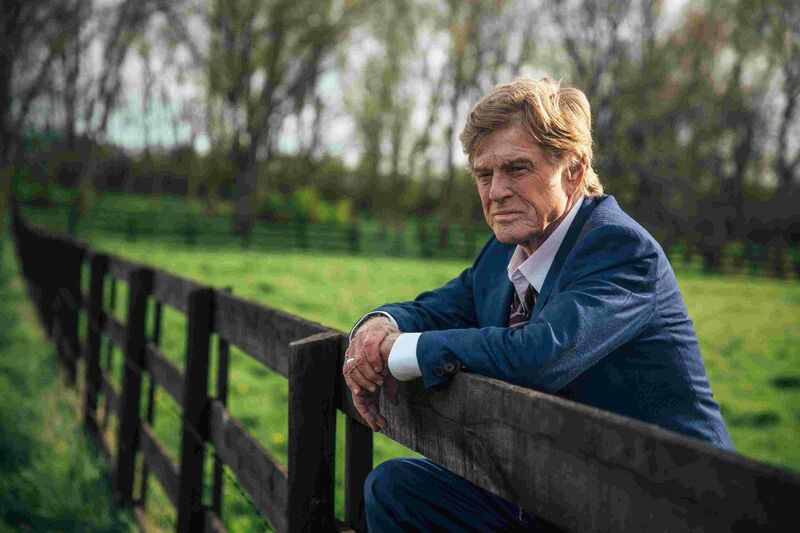 “The Old Man & the Gun”, Redford has said, is his last movie. We’ll see if that’s true but taken in that light it’s hard not to see the swan song of Redford and Forest intertwining. In a conversation on Jewel’s front porch, where they dissect the matter of what someone does in advancing age, she cites the necessity of keeping on. As she says this, Lowery lets his camera drift to the left and away from them, looking out across a field, as if wondering what awaits in the great beyond. It foreshadows a later shot when they walk through the same field where Forrest stops moving and the camera closes in on him as he looks out in front of him. At what who knows, because Lowery never offers a reverse shot. And maybe that’s the thing. Maybe he doesn’t know what’s out there in front of him, just as we all don’t know. All you can do, as Forrest does in his own nontraditional way, is try and go out on your own terms.